Many of my hikes and images are shot in this ecosystem, and I adore these trees — but in all honesty, show me a tree I don’t love! Pine flatwoods represent the most extensive ecosystem in Florida, and are distributed over 50% of the state’s land area. As their name implies, flatwoods have a low and flat topography, punctuated by differing kinds of pine, depending where you are in the state. I’m in the south, so it’s the slash pine that dominates this habitat! These flatwoods, or pine barrens, were created by changes in the sea level during glacial times — as the sea levels increased, expanses of land flooded, and sand was deposited. As the waters receded, early species such as pine trees were able to establish themselves in the sandy soil. Pine flatwoods are consistent: Layered, with high canopies of pines, a lower shrubby layer, and an herbaceous layer. They’re dotted with cypress domes (a cypress swamp in the shape of a dome), cabbage palm flatwoods, marshes, and other habitats. This is truly a fascinating ecosystem, and one that weaves so many others together. And while today’s flatwoods are less extensive, with more shrubby groundcover than in times past, they continue to be a vital ecosystem in Florida, covering vast expanses of land. Beginning in the 1950s, developers here discovered that this land was easy to cut and clear in enormous swaths — sadly, they haven’t forgotten. Doesn’t the world needs another empty strip mall and golf course? Flatwoods rely on controlled, or prescribed burning to maintain its community of pines, grasses, and herbs — and to prevent the forest from being overgrown. Controlled burns are vital to new growth, as well. Pine flatwoods continue to be fascinating areas to hike, each one being new; you never knows when you’ll encounter a swamp, open flatwood, or more of these beautiful trees — or the wonderful wildlife this ecosystem supports…. ….Unfortunately, flatwoods preservation does not get the press and support given to the wetlands. Developers target the flatwoods because they know that they will not be allowed to drain a marsh to build another bowling alley. I’m a wetlands kinda guy – but even I know that our slash pine habitat is crucial to SF’s ecology. EXACTLY. They don’t flood — well, rarely — so these ridiculous tear-’em-down developers LOVE this ecosystem. Flat, non-flooding? Rip it down! Forget about all the wildlife it supports. So I do think people should look to protect these — keep an eye on them, since they are especially easy to take for granted. I do love the wetlands, too… But the flatwoods are fascinating. I’ve strolled through them, into an open flatwood, through a swamp, back into a pine flatwood… It’s NEVER boring. Especially if you find one that’s pristine. … I actually live in one of those bulldozed former pine flatwoods. A few of the slash pines were left behind — old growth magnificent trees. Not surprisingly, those trees are also populated with a family of red-tailed hawks still scratching out a living in the area. Sure wish there were more (native) trees – and for that matter how to deal with our ever rising population. Sigh…. There’s ALWAYS life left behind, trying to find a way to survive. It’s heartbreaking. And as another mentions — it’s most definitely OUR duty to address this continuing issue, as you say. For their sake, and for ours. Who wants to live in a Blade Runner vista, lol…? Ditto, happy Tree Tuesday to you!! Thanks for all this info on the flatwoods. There is so much to learn, I am now also reading a lot on different kinds of climate. The temptation of humans to develop golf courses and malls stems from human overpopulations and religious or spiritual beliefs that larger families are better. We have to overcome this belief. There should be a population control law in place already for the U.S.. I know it goes against personal beliefs and freedom of choice, but the future of our planet is at stake. Just how do you justify families with 4-6 children? Just because they may make more money? Human population control is crucial for the survival of all future ecosystems, I believe. You’re so welcome! And you’re right… SO much to learn. I remember reading once, that the most devastating thing to the planet, ecologically… GOLF COURSES. Not war, etc… But Golf Courses. And when you think of the land being ripped up, the pesticides leached into the soil, the sod, the WATER it takes to maintain these vast expanses — yep. It makes complete sense. Believe me, I’m in agreement with you about our overpopulation issue… We as humans MUST be proactive in this issue. For the sake of the planet that we all share, and are taking gross advantage of. Thank you for another well-written, informative article! We all need to keep the pressure on at local, state, national and international levels to ensure the preservation of the planet. I can hardly wait to get back out among the pines now! Thanks so much for your kind words! I WHOLEHEARTEDLY agree. Without continued support of these places…and pressure, to counteract the wayward development…this amazing land would simply be bulldozed. Who wants to live in a Blade Runner flic? The weather’s so nice now, I’m chomping at the bit to hike! love the first photo, very beautiful! happy tree tuesday! Thanks so very much! To see them all in their natural ecosystem is truly an amazing sight… It’s quite a vista. I am from east Texas where beautiful pine tree forests are everywhere. Now I am living in central Texas, where pines are not so easily seen. It is really funny, but it is only recently that I am knowing that pine trees are present all over the Earth. Seeing a pine tree means “home” to me. Thank you so much for showing us these amazingly beautiful pine trees! Wow, that is so amazing! Maybe there’s a lesson here in this for us! another great entry for Tree Tuesday, enjoyed reading about the Slash Pines. Great post with beautiful trees! Believe it or not 2 weeks ago I had a heron in my backyard in NJ! He was ‘fishing’ in my koi pond! I’ve seen them up there!! (My mother lives in southern NJ — near the cranberry bogs. Great place for the waders!) Poor guys, it’s COLD! But it sounds as though he has some…err…easy fishing in your poor koi pond, eeeeks!!! What amazing scenery. Lovely trees! Thanks so much! I adore these guys…. It’s really a striking vista. Before reading your post, I have to admit to thinking of pines, or more generally, conifers, as being cold-loving trees. Now I’m trying to make a mental adjustment. If I guess I knew that bayous have those magnificent cypress trees, and they’re conifers. But when thinking of conifers, I tend to think more a long the lines of boreal forests. One of my favorite trees in Ohio is a conifer, the Eastern Hemlock tree (here’s a photo of a scene on Hemlock Trail). It is killing me that it is falling prey to another invasive, Asian bug, the Hemlock Wooly Adelgid. We lost our American Chestnut trees to an Asian fungus; we are in the process of losing our White Ash trees to an Asian bug (Emerald Ash Borer), and now there’s this new threat. I wonder if this destruction of woodlands is all one way, or whether North American bugs and blight are harming Asian forests. Pines really are everywhere! I grew up smack in the middle of the South Pacific, a few degrees above the equator, on a tiny island. TINY. And we had pines! 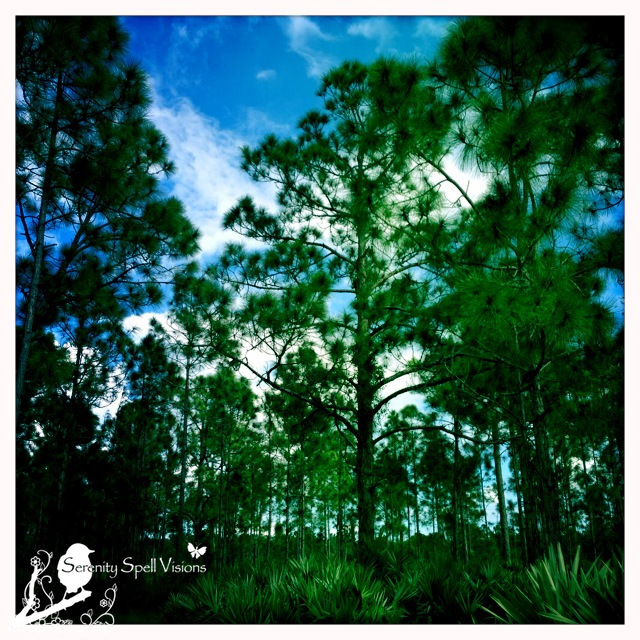 Australian pines — which are actually a menace down here in the Everglades…. I had heard about the Chestnuts, but not about the Hemlocks. To think of these ancient, enormous trees falling prey to these invasive insects is heartwrenching. I can’t help but think…. There’s nothing anyone can do? I know the West is suffering a similar fate, and has been for years — bears have been starving, because their food source has been disappearing due to such bugs. And yet nothing can be done? Really? I can’t believe no one’s mentioned John McPhee’s wonderful 1968 book, “The Pine Barrens”. It’s set not in Florida but New Jersey! He does for those pine barrens what he later did for the Atchafalaya Swamp – it’s a terrific read and a reminder that similar ecosystems exist in widely separated locations. 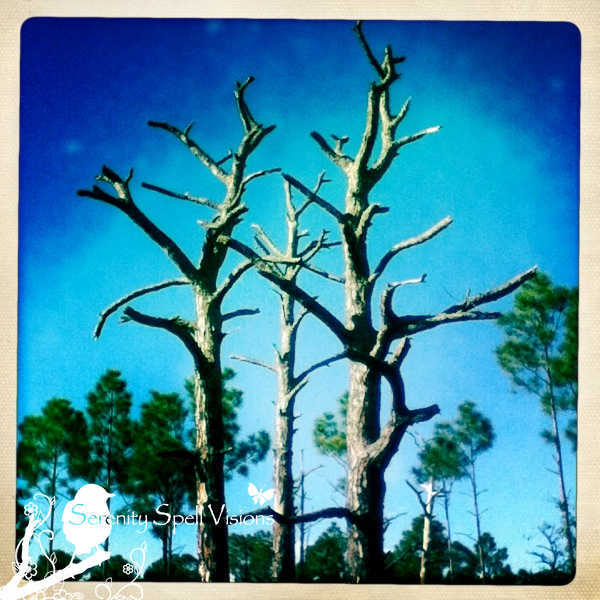 Loved your post – I never would have imagined land like this in Florida! Your state certainly is more varied than I’d ever imagined. And thanks so much… This land is indeed amazing, and widespread, once you get out there. Hopefully it will remain widespread, if conservation efforts can continue to hold back the tide of development. …. I, too, came from the edge of the NJ Pine Barrens, and spent 10 years working in the Cranberry industry. I’ve spent many a day in there. On the one hand, it is excruciatingly boring – you see one square mile of Jersey flatwoods, you’ve seen all 1,000 square miles. On the other hand, there are sections unique in the world. There are large tracts of pine forest and oak stands populated by fully mature and grown trees that are only 5-10 feet tall! It also offers some of the best forested canoeing anywhere. Ah, I’ve never done that (the canoeing, that is). But it really is a fascinating area… Incredibly varied. Sometimes – actually most times – I wonder if mankind knows what he/she is really doing in these so called “controlled” situations!!!! SO very true… There’s still an awful lot of ignorance out there. But, one must hope — a growing awareness and education?!?! I sure pray!! !